Today was another day of getting from "a - b". 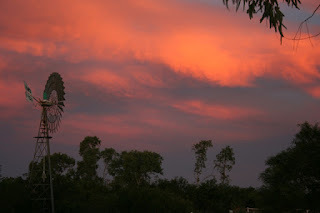 But first I had the absolute joy of getting up before dawn and watching an amazing sunrise. 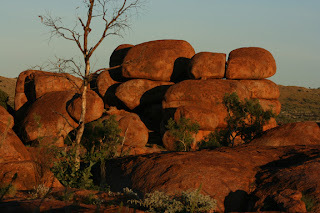 The sunrise itself was amazing but the spectacular colours on the Devils Marbles was nothing short of breath taking. 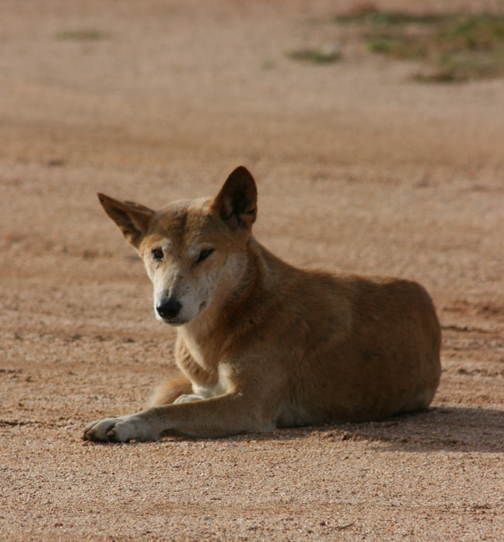 Just as we were about to do the final check on the packing up of Myrtle a dingo wandered over and just sat himself down. We had heard a dingo howling during the night so I am thinking it was this guy. He wasn't scared at all, I think he probably has got used to some tourist leaving scraps of food on the ground. As these are wild animals it is really unwise to feed them. He looked fairly old and you could see a few scars where he had been in a fights. His visit just topped off an absolutely wonderful 12 hours. Our overnight stop was at a roadhouse in Renner Springs. Let me say it wasn't the best location we have stayed in, in fact it was defiantly the worst. You could see the roadhouse had a lot to offer it just wasn't loved enough. But in true Northern Territory there was another magnificent sunset.